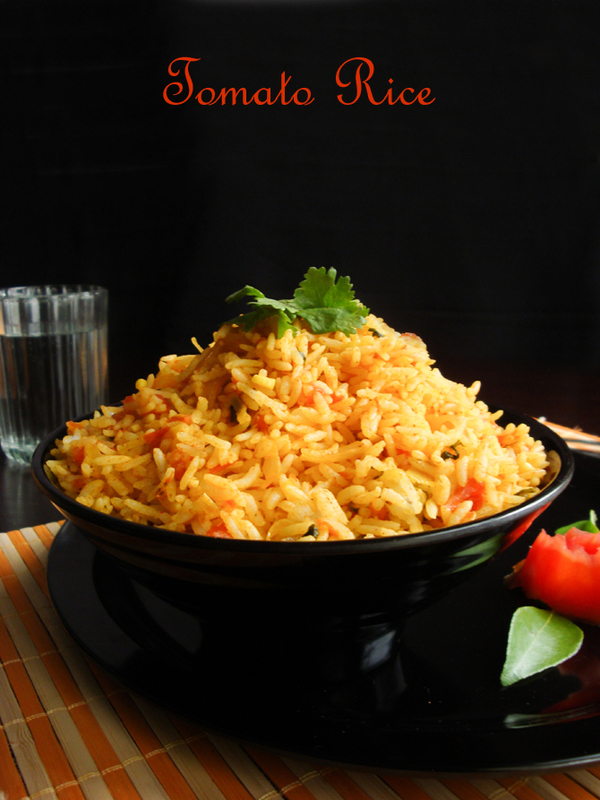 Tomato Rice is a Tangy delicious recipe made from common spices and tomatoes. This is such an easy recipe which can be made in less than 30 Minutes. 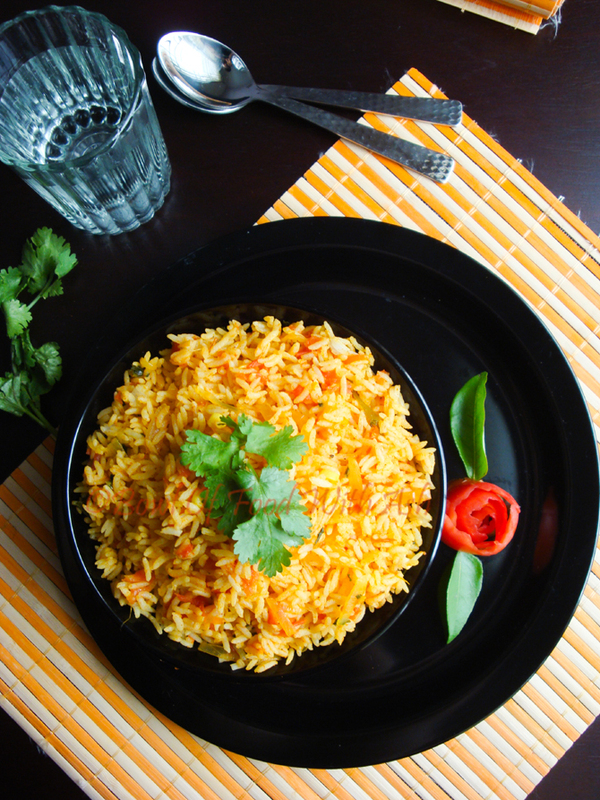 I like flavored rices and these helps me during weekdays to quickly cook my meals as well make tummy happy :). Tomato rice can be made using tomato puree as well, but I love to have tiny bits of tomato. I have chopped tomatoes finely and used it. 1.Soak the Rice for 20 - 30 Minutes.Drain the water.Pressure Cook the rice with 2 Cup water for 3 whistles. 2.Chop the Tomatoes finely and cut onion length wise. 3.Chop the Garlic cloves to small rounds, Green chillies to length wise. 5.Now add Curry Leaves,green chilly and saute for 5 seconds. 6.Now add Onion. When it becomes light brown, add garlic and saute for 10 seconds. 7.Add Chopped Tomato,Turmeric powder,Red chilly powder,Coriander Leaves,Salt,garam masala powder and mix well. 8.Cook covered till Tomatoes becomes mushy.Do not add water. 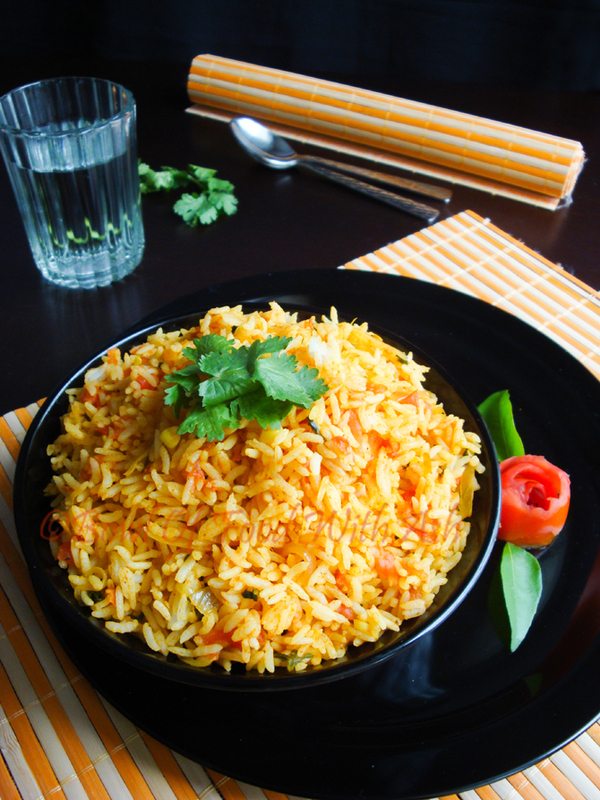 9.When Oil seperates and tomato mixture comes together add cooked rice and mix it gently. 10.Keep on medium flame for 1 minute stirring occasionally and switch off. 11.Garnish with Coriander Leaves and enjoy.